On Tuesday, February 18, 2014 the Undergraduate House of Representatives (UHR) approved UHR Bill 14U024 to change the Election Code of the Student Government Association (SGA). The bill will reduce the number of available seats from 72 to 51 for the Spring 2014 election. The Bill was authored and proposed by the Co-Op Representative, UHR Secretary, and UHR Elections Committee Chair Andrew Block. Under the current system the 72 Undergraduate House Representatives consist of 51 by Major, 16 by Class – 4 from each – and 5 “Special Reps,” which include the Co-Op Representative, Athlete Representative, and Representatives at Large. The 51 Major seats are apportioned by granting one Representative for each block of 400 students. For example, if a major has 5 students or 400 they are apportioned 1 Representative, while a major with 401 students would receive two Representatives because they fall in the 401-800 range. The need to reduce the number of seats in the UHR has been under discussion for some months. 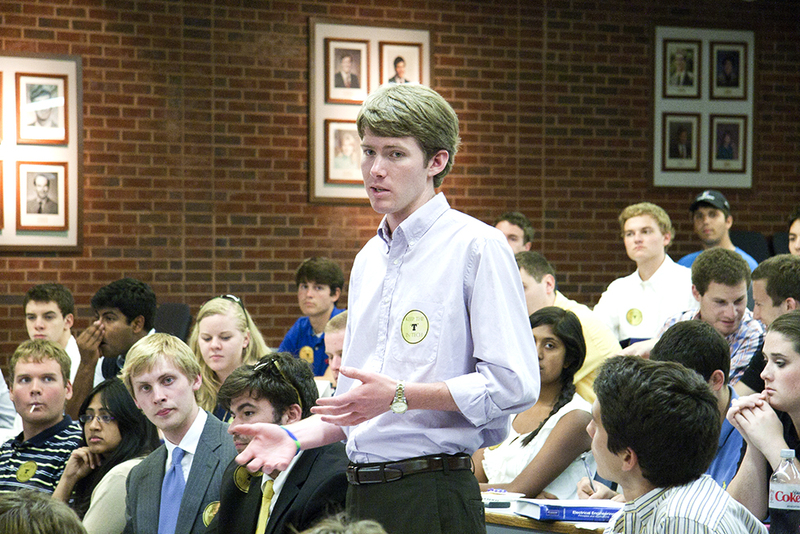 According to Rep. Block, “The bulk of the changes in the Elections Code were written and approved by UHR leadership and our Student Body President & VP back around November and the changes to representative distribution happened in mid-December.” The impetus for change stemmed from SGAs leadership perceiving both a lack of student involvement in their governance and students feeling they were not, “truly represented by their Representatives,” says Rep. Block. By reducing the number of available seats they hope to address both of these issues. This Bill was opened for discussion at the end of a three hour meeting, the first since Tech was closed due to winter advisory last week. At the prior meeting on February 5, 2014, Rep. Andrew Block presented preliminary proposals from the Election Committee to the UHR with several options for reallocation. This week those options had been narrowed to two. The first was that of Rep. Block and Rep. Laura Burbach, who was instrumental in deciding the specifics of the changes along with Rep. Graham Goldberg who rewrote most of the changes to the Election Code. Under this proposal seats are apportioned by School rather than Major, and the apportionment is increased from 400 to 1000. The 16 Class Representatives remain unchanged, but one of the Members at Large is cut, reducing the Special Reps to four. The second, proposed by UHR Treasurer Alex Bandes, distributes seats according to College, rather than School or Major, reduces the number of Class Representatives to three per Class for a total of 12, and reduces the Special Reps to 3 for a total of 37 Representatives. The floor was opened to discussion among the 39 voting Representatives that were present, just one more than necessary to maintain quorum. It was established early that all were in favor of adopting one of the two proposals, the debate focused on determining which of the two would be carried forward. The Block/Burbach proposal was dubbed Plan A, while Bandes proposal was dubbed Plan B. Lively discussion ensued between proponents of each method. A drawback of the Block/Burbach proposal that was mentioned repeatedly is apportionment by School gives a disproportionate number of seats to the Ivan Allen College of Liberal Arts (IAC) and College of Science (CoS), which have only 404 and 1,110 students enrolled respectively, but would have 6 seats each – a reduction of one from the CoS over what the two colleges have under the old system – while the Scheller College of Business (CoB) and the College of Computing (CoC), with 1,301 and 1,192 students respectively, only have two seats each, and the College of Engineering (CoE), by far the largest with 9,219 students, would be reduced to 13 seats among its eight schools, down from 28 previously. The Bandes proposal was meant to address this imbalance. Since the IAC and CoS are broken into six schools each, with as few as 45 in the CoS School of Earth and Atmospheric Sciences, and each of those schools would be apportioned one seat, apportionment by college would remove that imbalance. Under this system IAC would have only one Representative while the CoE would have 14, as the apportionment is one seat for every 600 students. While this addressed the imbalance between colleges, opposition felt this reduced the quality of representation of students as, “Aerospace does not represent the same interests of Biomedical or Electrical Engineering,” as one representative stated. Those in favor of Plan B touted the fact that 37 seats accurately reflect the number of representatives that consistently attend meetings every week which would further incentivize those to campaign for elections and be active in the UHR. With 39 representatives in the room at the time and repeated difficulty meeting quorum over the last few years this idea resonated with several of those present. Senior Class Rep. Andy Looper, who was appointed by vote of the UHR only weeks ago, professed his intention to campaign strongly in the upcoming election for next year, admonishing the House that, “Every single person in here should be afraid they’re not going to have their seat next year,” which was answered with general applause by wrapping on the tables, a show of approval particular to UHR meetings. The vote to approve Plan A passed with 37 in favor, 2 against, and zero abstentions bringing the changes into effect. The next Bill was 14U030 which was a constitutional amendment to remove the number three from Article 2, Section 2 that states the number of Representatives at Large, leaving it under the Election Code alone making it easier to adjust in the future. The final business of the evening was the unanimous approval of a bill to appoint eight more representatives, of which only six were present to be sworn in. According to a survey of the UHR conducted by Dillon Roseen, soon to be appointed to the executive position of Director of Internal Development, 24 of the 45 representatives that responded were appointed by vote of the UHR while only 21 ran in elections.